Welsh Secretary Paul Murphy and First Minister Rhodri Morgan have discussed the spate of 13 suspected suicides in a year in and around Bridgend. Mr Murphy revealed their talks on the issue in a Commons written reply and added: "Such tragic incidences are of great concern and distress to me." A special taskforce has been set up to examine other "so-called copycat suicides" in Bridgend since 2004. Police are also reviewing a number of the deaths, all of people under 26. Ms Moon, the Labour MP for Bridgend, is among those who have voiced concern about the possible effect of social networking websites which some believe are "romanticising" suicide. The MP has previously said she was growing increasingly worried by the appearance of so-called "memory walls" on networking sites like Bebo, where members leave messages to mark the death of a friend. Now she has secured a Commons debate on the issue of suicide prevention on Thursday. Mr Murphy said the taskforce which includes police, children's services and mental health experts would determine if there are any links between the suicides. It would ensure that other young people, many of them the victims' friends, have access to counselling and other support services. Natasha Randall, 17, of Blaengarw, near Bridgend, who died on 17 January, was the latest young person found hanged. Several other young people who have died in the area knew each other. They include Leigh Jenkins, 22, who was found hanged two months after his best friend and neighbour Alan Price, 21, died in the same way. 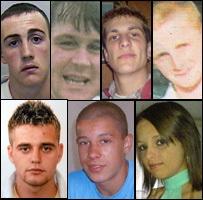 Another was 20-year-old Thomas Davies from North Cornelly, who hanged himself in February 2007. He was friends with David Dilling, 19, and Dale Crole, 18, who had been found dead weeks earlier. South Wales Police are reviewing a number of the suicides in the past year around Bridgend, but they say there is no evidence of a "suicide pact," nor anything to suggest the deaths are linked. The local coroner has also he said he does not believe there was such a phenomenon as a "cluster" of suicides, and that it was a problem across the country.